I recently started on the Pomme de pin cardigan. Love the look of this cardi, even went and ordered yarn specifically for it. I measure 39" at my full bust, and this cardigan is supposed to be worn with some positive ease. BUT, the sizes are just a little off for me. There's a 39", which would JUST fit me, then there's a 45.5", which means a 6.5" positive ease cardigan. No bueno for this particular knit. I decided I'd knit the 45, and maybe just not block it out all the way. Merrily I went along knitting the ribbing. All the while alternating skeins (like a good girl does when she's using hand-dyed yarn). I finished the ribbing, and set up for the lace. Wasn't as complicated as I thought it would be, judging by other peoples notes in their projects. Cool....on my way with the lace then. I must be such an awesome knitter right? 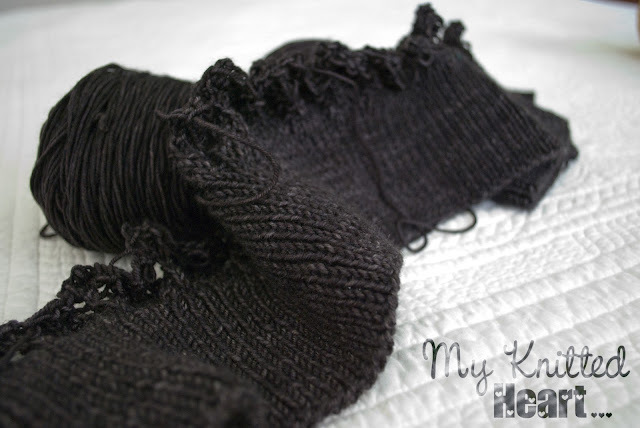 Not to have fallen to the same woes that all those other wonderful knitters did? Wait...am I increasing stitches here? Why yes...yes I am. Everything worked out great on row 1 of the lace chart. I just didn't realize I was increasing along one of the side seams by working an extra YO when I should have left it off. Being that it was probably close to 11 that night, my sad and tired little brain just couldn't bear to figure out where I went wrong. I knew I'd messed something up, and that was good enough for me to stop. Good thing I did though. As I was getting ready to rip back just the lace, and put it back on the needles to start the lace over, I heard a little voice. It said "Psssstt!, hey.....hey you, why don't you try it on? What can it hurt?" So I did. Holy yarn cakes! No, this will not do. I stood there and stared at the pile of knitting for a bit. I played with the idea of knitting the 39, and blocking it a little more aggressively, but I knew I wouldn't be truly happy with it if I did. Not many options here. 3. Knit the 45 and never ever wear it because it's just a smidge too loose and I don't like it. I'd cry...just cry. 4. Get my math on and modify it to fit me. Oh fine then, you don't have to rub it in though. I normally have absolutely NO problem with modifying and working a little math magic to get something I want. But once in a while, I don't want to think. I just want to knit something according to pattern, and have it work out well. This was really really really one of those times. I've read through the pattern again and worked out a new chart. There are 4 repeats of the chart between sizes, so I worked out a way to eliminate only two repeats from the size 45 evenly, which will give me a size right in the middle. The one I NEED! I'm dreaming, and I haven't really done it yet. Hate it when that happens.